Hate breeds hate. I watch videos of protesters from a church I will not name for fear of providing more attention to their cause. They aim to inspire anger in people. Expressed anger only proves to work as evidence to these people they are doing right by their creator. As one who dabbled in martyr-like behaviors as a child, I understand how suffering may be rewarding to someone who feels their suffering is the result of his or her service to the higher cause. A martyr may see any pain experienced as affirmation that his or her efforts are valid. When we speak of people who suffer in the name of God, this pain is almost always said to be rewarded by God. Furthermore, a disconnect from any words or social stigma in the setting of these picket lines is easy to establish, as a picketer can dismiss opposing perspectives as incorrect and, in the case of the perspective held by the church, evil. When a simple map of evil and righteous is laid out in black and white and God’s wrath is said to be the penalty for anyone who deviates from the righteous path, it may be very difficult for one, especially a child, to choose deviation. I would love to meet some of these people and tell them I disagree, but love them anyway. If permitted, I would hug each member and feel empathy and pain for them. I know how much hate hurts. I don’t believe we were made to feel hate. Let’s take our lead from the generation that preached love. 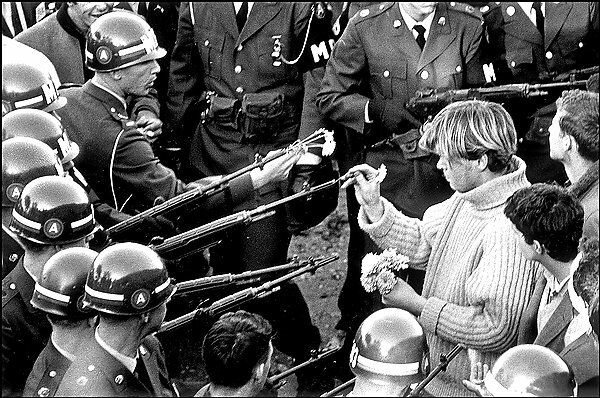 As hippies placed flowers in the barrels of riffles, I suggest we aim love at hate. I was sitting in a waiting area at the Austin VA (Veteran’s Affairs office) listening to old vets express their opinions on politics and topics of that nature. One older vet took the stage and steered the conversation. He was very opinionated. Another older vet made the mistake of making a proclamation the first man did not agree with. By the first man’s tone and views in his previously expressed opinions, the second vet’s expressed perspective would seem a logical step. It was not and the first vet made a firm statement in disagreement, “No, it is not, sir!”. The second man attempted to retract his statement without completely backing down: “Well, I guess it’s just how you look at it.” The first man was not satisfied and proceeded to provide historical examples, proof that this other man was wrong. The second vet was quiet. The first then steered the conversation in another direction: “I raised my boys right. I told em, ‘You can bring home the ugliest girl you can find and I’m okay. But you bring home a boy and I don’t know you anymore. '” He received little response from his audience. He then moved on to weight gain and loss. He looked to me as if attempting to include me in the conversation. I was tempted to say something along the lines of “Don’t ask me. My boyfriend is always jealous I can eat anything I want and not gain any weight.” I held my tong. I didn’t want to cause offense. When I refused to act, God acted instead. A woman in her mid-thirties entered and sat across from the first man. She had short hair, tattoos, and gauged ears. She was wearing knee length shorts and a t-shirt. She invited herself into the conversation about weight gain and loss. The older man was civil and courteous. I was unsure of whether he understood what her physical representation of herself implied. I cannot say for certain she was gay, but she bore a lot of the physical characteristics associated with homosexual women in our culture. Perhaps the man’s views on homosexual women was different from that on homosexual men. Either way, it was brilliant to see this man who had sputtered hate one moment be courteous and friendly the next to a person who was likely a member of the group for whom he spoke hate. I laughed to myself. God’s placement of irony in my world was not lost on me.